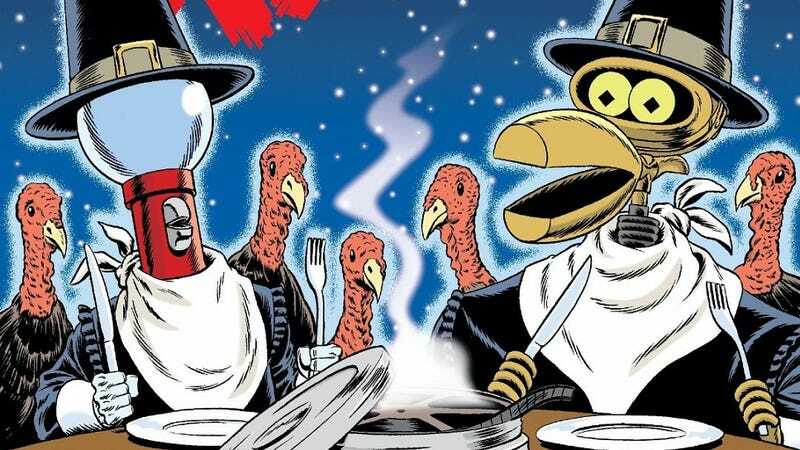 Save room for another MST3K Turkey Day Marathon this year! The Nerdist has confirmed that Joel Hodgeson will again be hosting another streaming Turkey Day Marathon of six classic MST3K episodes from the Shout Factory archives starting Thanksgiving Day at 9:00am PT/12 Noon ET on the easy to remember mst3kturkeyday.com. Last year's marathon was incredibly fun, and while I miss the ol' red jumpsuit and Satellite of Love set, it was great to see Joel bring his own particular brand of weirdness back to center stage again. This year promises more surprises and special guest appearances, which could mean anything, but for those of you who've received your Volume XXXI DVD sets a month early by ordering directly from Shout!, you might have noticed some new Tom and Crow skits shot for the special Turkey Day intros, so I wouldn't be at all surprised if they filmed a little something extra for this year's festivities as well.